The loss of communication is one of the most profound disabilities a human being can experience, inhibiting social contact and complicating medical and personal care. Locked-in patients are paralyzed and unable to speak, but cognitively intact. Developments in biometric technology provide non-muscular channels of control and provide opportunities to restore some communication for people with little or no muscle movement. Although these biometric devices have been effective, the input rate is very slow for the requirements of interactive communication. Prediction techniques increase the speed of communication in assistive technology. However, the user’s context (time of day, location, presence of conversational partners, user’s interests, etc.) can be included to make the selection of desired phrases or utterances easier and faster. This research presents an approach to developing user profiles for locked-in users. The profiles can be used to enhance the speed and accuracy of conversation by reducing the selection space for conversational topics. 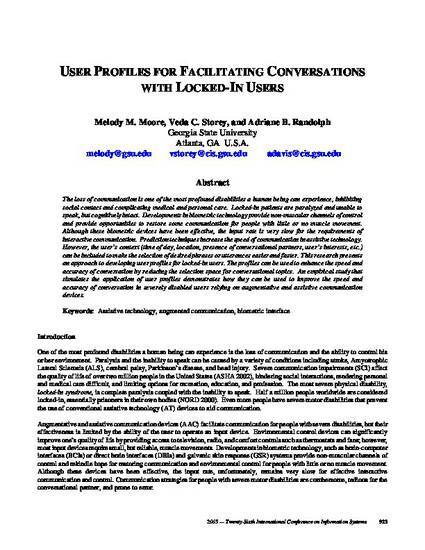 An empirical study that simulates the application of user profiles demonstrates how they can be used to improve the speed and accuracy of conversation in severely disabled users relying on augmentative and assistive communication devices.